Cameron's social calendar was quite full this week with two restaurant outings! Cam's tolerance and patience for eating out is actually better than most adults! Monday was Anne's birthday, so everyone went to Outback restaurant to celebrate the fun occassion. Cam loves the Outback mac-n-cheese and drank a huge glass of milk too. A free birthday s undae completed the meal and Cameron was pretty happy Annie decided to share. Saturday night was a mexican fiesta at Don Julios when Jane, Chris and Cam took Ronda out to dinner. Cameron loved the tortilla chips and tacos. 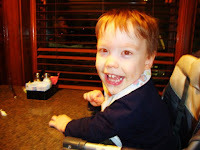 Another exciting event this week was the removal of Cam's "seat" on his walker. The big boy handled the challenge like a champ! Chris also took the time to put Cameron's "license plate" up on the door to his room. Grandma gave him the license for Christmas and now his name is officially displayed.